Some mornings I feel like Washington at Valley Forge. The propaganda of the Deep State is relentless. What a misnomer it is to call it “The Resistance.” It is obvious some big money is involved, when it blares from posters in glass cases in public places in New York City. It is not the voice of the sweltering poor. It is insidious, and is seen virtue-signaling from the plot of a Broadway play, when you head out to “take in a show.” However a truer “Resistance” shines from the efforts of the individual actors, striving not to be “the masses”, but the best of the best. Liberal means “generous”, and there is nothing wrong with being generous. Jesus was generous. But it is not generous to tax the crap out of people to enrich your own greedy life. That is gross hypocrisy. It is far better to be an individual seeking to be superlative, the best ball player or the best actor. Then you are giving all you’ve got. It is individuals giving all they’ve got that makes America great. It is seen in the boss, and in the boss visiting an obscure corner of his factory where a sort of family of workers do one step of a process better than it has ever been done before. The genius of the Founding Fathers was to tame the despotic tendencies of leaders and allow individuals to have rights, and it is the poison of the Deep State to remove those rights. The distinction is obvious to me, but sometimes I despair I’ll make it clear. The Big Lie of the Deep State blares on and on. The true debate is between greed and generosity, but no one really talks about the real debate, and instead many blather about empty issues like Global Warming, which is an exercise in witlessness. If you ask an Alarmist what an “isobar” is, they think it is where Santa drinks whisky. They haven’t a clue, but still manage to virtue-signal down their noses and call me a “denier”. I fight against depression and defeat. What purpose can be served by bruising me. Have I not proved faith, singing in thunder? On powdered skin. Why not show me Your smile? As the Dead Sea thumps surf on sighing shores. Add Your flashing smile to my poetry. What purpose is served by misery? The Surgeon is my friend, despite His knife. Wears a blindfold to be able to see. Endure my scorched passages mustering trust. My mood was not at its best Sunday morning, for I’d been up long past midnight and also my youngest son drinks no coffee, whereas I am an addict. I was astonished a kitchen could even exist without coffee. Perhaps a caffeine-free morning contributed to my gloom. However to my surprise I discovered I didn’t die, and in fact as I stepped out Brooklyn’s bricks astonished me with their orange brilliance, and the green surprised me as well, as I was unaware a tree grew in Brooklyn. It is bragged that 600 languages are spoken in New York City’s Burroughs, by those who see it as being a sign of liberal diversity and multiculturalism. I’m not so sure it is a good thing, because I cannot help but think that somewhere else 600 communities have been lessened, and perhaps even destroyed. A community is a sign of God’s creativity, but ignorance loves to destroy. Some people think Satan will manifest as a sort of Godzilla tearing down skyscrapers, but it seems to me he has no problem with material things; he won’t bother bash skyscrapers; what he dislikes is Love, and in my time I have witnessed the destruction of families, neighborhoods, clans, tribes, and communities world-wide. Liberals once decried the idea of a neutron bomb, which would kill people without the damage to material objects an atomic bomb manifests, yet they have said little as families and neighborhoods have been evaporated. Some even clap their hands, deeming the small-scale patriotism of a tight family a type of racism, as if even a mother’s love is evil and opposed to a faceless ideal of one vast McCulture. How much of the world has been destroyed the past sixty years? With hardly a whimper. Yet as I trudged the sweltering street, desperately seeking my first coffee, I had the strong feeling God cannot be denied. I might be only one language of six hundred, and my skin might be only one hue of six hundred, but there was no way this swirling I was midst was going to become a melting pot, creating a drab smear of a single, muddied hue. Already new clustering was occurring, as the will to excel individually combined and created new marriages, new families, new neighborhoods, on its way to the recreation of 600 springtimes, if not 601. Having proven optimism does not require coffee, I did find a coffee shop. Then my optimism soared, helped out still further by finding a church. And dance when I’m back home in my green wood. That One Light is in all eyes reflected. Generosity is fine, as long as you are generous with your own money. It is when one starts being generous with my money that I start to steam. And it is when one is generous with my money, and gives it to people I think could be better served by swift kick in the pants, that the steam starts to whistle. I don’t recommend this, but the best test (of how Liberal a person is) is to yourself be down and out. All your fair-weather-friends flee. Funny thing is: They were so, so Liberal, back when you were buying the beers. When I was young I justified my sloth by saying I was an artist, and I think I actually was, (though apparently not a very good one). I worked as little as possible and scribbled as much as I could, and managed this by, (to use a less-than-flattering word), mooching. However I discovered two things. First, when you don’t pay rent you still wind up paying a sort of rent that doesn’t involve money. Second, even the kindest people get fed up with even the nicest moochers. Eventually their generosity shifts from mushy love to tough love. People get tired of a poet looking at clouds and nibbling his pencil’s eraser. Either they show you the unwashed dishes and laundry (which amounts to the non-monetary rent I was talking about), or they show you the door. Perhaps the most touching (and embarrassing) episode involved a person so kind and so meek they couldn’t throw me out, so they themselves moved out. Abruptly, at age thirty-one, I was responsible for something I amazingly had never faced: “The next month’s rent.” I had occasionally faced “the next week’s rent” or “my contribution to part of the commune’s rent”, but had never paid a month’s rent in its entirety. Talk about a crisis! It was bad enough that I had driven my kind host from his own apartment, but I now had to work a Real Job. I couldn’t drive off and sleep in my tiny car, for it wasn’t functioning just then. It was right around this time a fellow moocher told me how much money one could make off the generosity of others, simply by asking people for spare change. This was against my psychological make-up. In fact one of the reasons I was in the mess I was in was because I was incredibly shy, and unable to ask for any sort of help, whether it be with getting my “great art” published, or whether it involved asking how to fix my car. You might think that by age thirty-one I would have learned to be more forceful, but I had a very strange Karma. The times I had steeled my nerve, and huffed and puffed, and dared ask for help, I always seemed to ask the worst people. (That is ten tales for another evening). Rather than learning how to be outgoing, I became not only shy, but very discouraged. I headed out onto the streets, and found it was, for me, like asking a very beautiful woman to dance. I just couldn’t do it. I stood on the sidewalk, looking at passing people in a way that likely made them very uncomfortable, and never dared say a word. How pathetic can a man get? Fortunately I was addicted to cigarettes, and addiction (or ordinary hunger) can supply motivation which pep-talks and self-psychiatry can’t. By the second day I was gasping for a cigarette, making people even more uncomfortable, as they walked by, and I still wasn’t daring to ask them for spare change, but I was getting close to it. The truth of the matter is that the fellow’s gale of spittle was a great dose of tough love, for I never, ever dared ask anyone for spare change ever again. If he had given me even a penny he would have encouraged me the wrong way. As it was I was forced, (against my will, I’ll admit), to leave off looking at clouds and to get a Real Job. Things didn’t exactly go uphill after that, for the job I got utterly sucked, but my downhill slant was less perpendicular. I had a lot of work to do and a lot of suffering to experience, before I had any real sense I was heading uphill. Yet I felt strangely cared for by God. After all, what are the odds of getting such a gale of spittle the very first time you ask for spare change? It was fairly obvious to me that I wasn’t suppose to be a spiritual Sadhu with a begging bowl. And, because I had a spiritual steak, and was insanely optimistic, I figured I must be being guided by God to some better place. I needed to think up some poetic symbol for the uncomfortable situation I was in, and recall remembering my father telling me about his days as a flight surgeon for test pilots. He’d told me that pilots pulling an airplane out of a dive experienced many “G’s”. The “G’s” increased the more they went from perpendicular to horizontal, and and continued even as the nose of the airplane pulled up; the “G’s” only started to decrease as the airplane started to move perpendicularly upwards. This seemed a good analogy. If you dislike suffering, you can continue to experience weightlessness as you continue your nosedive to certain death. But if you want to pull out of your nosedive, you have to experience the “G’s” of, first, ordinary gravity, and then worse-than-ordinary gravity, and in the end you avoid not only certain death, but get to soar up to the sky. However the important part of the analogy was that the “G’s” continue even after you have started to pull out of the dive and are headed up. This allowed me to walk cheerfully whistling, and to think I must be heading up, even after my one-and-only attempt at pan-handling was a complete failure that left me misted by spittle. Whoever that fellow was who cussed me out, over thirty years ago, happened to be, I’d like to thank him for his tough love. 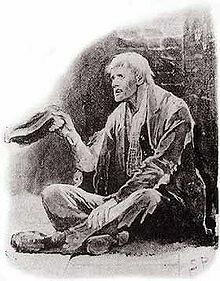 He probably is an old man now, feeling guilty about how he lost it and cussed out a poor beggar, back when he was much younger. He likely has no idea of what a good thing he did for me, nor that he may even have been a tool of God. If he had been liberal with mushy love rather than tough love, he just would have encouraged me to be a pan handler. As it was, he encouraged me to be self-reliant, and eventually the father of five. Now the five kids have grown up to five fine adults, and I’m facing the fact I’m getting older and weaker, and did not do a very good job of squirreling nuts away for the winter of my life. In the old fable of the grasshopper and the ant, I’ve been the happy grasshopper, bounding from job to job, and sometimes to no job at all. I did have to become more serious while raising five kids, but even then I did things, (such as homeschooling), that were irregular. I simply couldn’t bear the drudgery ants endure, going to the same hole day after day to get a stupid pension. Now they vacation in the warmth of Florida, and I face the winter I’ve earned. As I sit down to do my taxes this year things look fairly bad. I didn’t budget for having a kidney removed. I absolutely hated doing taxes, even when I knew I’d get a refund back, but this year I’ll probably owe money I don’t have, so I absolutely loathe the paperwork even more than usual. In some ways I feel I’m right back where I was at age thirty-one, in a situation where I may have to ask for help. I noticed some other websites have “tip jars” at the side, and was thinking of putting one on this site. This goes against my nature, and wounds my fat ego, for one thing I’m proud of is that I’ve never “sold out.” In fact this is just a way of saying my writing has never made me a cent, but I figured it was better to be proud about my lack of success, than to be ashamed. Also a “tip jar” is a bit like a “begging bowl.” In fact that is what I will call my “tip jar”, if I ever have the guts to institute one over in the margin of this page. But I likely will lack the guts. After all, that fellow who responded to my first attempt at pan-handling might still be around. Instead I think I’ll avoid looking at my own problems, (and avoid starting my taxes), by sneering at people who have problems even worse than mine. Isn’t that what we usually do? Because my taxes are due, I think I’ll start with the politicians in Washington DC. When they just print the money they don’t actually have, to pay their rent, they are like beggars who don’t even have to pan handle, because they can just print what they crave. Will this pull them out of their nose-dive? No. They need some tough love. They need to stand in a gale of spittle, so let me supply some. What they need is a dose of common sense. We need a Thomas Paine to write a modern “Common Sense,” for the beggars in Washington. To some degree it is happening on the web, but we need a Thomas Paine to really slam the point home to those poor, begging imbeciles. Otherwise, because they can print money they don’t have, they think they are rich. We need to nudge them with the reality that they are worse than bankrupt. I can tell you from personal experience that it is no fun to stand in a gale of spittle, but I also tell you it does you good. Ask any recruit who came out of boot camp a better man, and he will tell you that the sergeant’s gale of spittle did him good. It is a side of Liberalism most liberals now deny, thinking it is better to stay in a nose dive and experience no “G’s” at all. In fact to produce a gale of spittle is deemed “politically incorrect”. There are times love is not mushy and gushy and sweet. There are times we have to be tough. I happen to dislike such times, especially when I have to be tough on myself, but they are a Truth. Liberals need to be generous with Truth. If they deny tough Truth, then they are no longer generous, and are actually no longer Liberals. The idiots in Washington think they are Liberals because they can print money they do not have. This is not generosity. It is insanity. Even I eventually figured out you need to face the music. I had to do it at age thirty-one, and I now have to do it again, at age sixty-three. This brings me back to my own problems Berating Washington DC didn’t help a bit, but it does feel good to blow off some steam. Likely it would be more constructive to go out and split some wood. Then face the taxes. And after that, face the finances. In any case, there may be fewer posts on this blog, as I won’t have time to look at clouds and nibble my eraser. I’ll have to dust off that tiresome old mantra, “When the going gets tough the tough get going,” though I never really figured it applied to me. In fact I think my soul was accidentally put in the wrong body, when I was born, and that I was suppose to be a cat. Is when my old, snarled cat comes complaining. And when I look down on my cat, she’s purring.